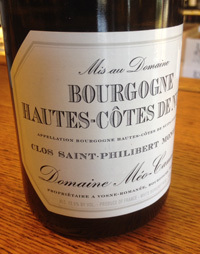 2011 Domaine Meo-Camuzet, Bourgogne Blanc Hautes-Cotes de Nuits, Clos Saint-Philibert Monopole, White Burgundy, France. As a huge fan and admirer of Meo-Camuzet, one of Burgundy’s great producers, especially their reds, it was great to re-taste their rare domaine owned vineyard white, the Clos Saint-Philibert Monopole, Hautes-Cotes de Nuits, which it turns out is very stylish and lovely Chardonnay. The Clos Saint-Philibert is from an exclusive site planted in the early nineties on a mix of soils with clay, limestone and gravel, it is extremely rare and an exceptional value in today’s sky high Burgundy reality. Meo-Camuzet were long guided by great hands including Henri Jayer, who even mentored the current head of the estate/domaine Jean-Nicolas Meo, who himself has run and made the wines since the late eighties. The white from Meo is focused and sharp, clear and persistent with classic aromas and layers, starting with white flowers, citrus and honeyed nuts leading to a fine and medium weight palate of apple, pear, lemon and white peach along with steely mineral, wet river stone, clove, fig and subtle wood notes with an almost green melon feel and bright acidity. This graceful and vivid, greenish-golden hued Chardonnay is impressive now, highlighting the generous nature of the 2011 vintage, but has the structure and detail to age well for another 5 to 7 years at least, drink from 2014 to 2021, this is beautiful wine.